Summer means long days lying in the sun, sipping lemonade, and swimming at the local pool or jumping waves in the ocean or snorkeling at the lake. At least, that’s what it meant when I was growing up. But the summer I turned 10 years old, I almost missed out on my favorite activities. I needed a cast on my leg, from the top of my thigh to my bottom of my ankle. Swimming was out. I was bummed. But when I went to the doctor’s office to get the cast on, he shared some good news. He was going to use a new casting material, fiberglass. (I’m old; it was new when I was 10.) It would be lighter than plaster. But best of all, it could get wet. In hindsight, I’m sure what he meant by “get wet” and what I understood by “get wet” were very different things. I thought he meant WET. I thought he meant I could swim with it on. Now, I’m sure he meant it wouldn’t melt if it got rained on or bath water splashed on it. To make matters worse, it seemed like there were no intelligent adults in my life that summer. Strange, because I was surrounded by intelligent adults—bankers, engineers, teachers, college graduates. But none of them questioned me when I insisted the doctor said it could get wet, so I was going swimming. It didn’t go too badly at first, just swimming in the pool. It took a long time to dry, but nothing bad happened. Then came a trip to the lake. Yes, I went swimming in the lake with a cast on my leg. But my biggest mistake, and when the adults must have had sunstroke or something, I went in the ocean—with a cast on my leg. For a week I swam, jumped waves, laid on the beach, played paddle ball, did all the things a 10-year-old does at the beach. A few days in, my leg inside the cast started getting itchy. Those same sun-stroked adults came up with a plan. We went up to the shops on the boardwalk and bought a back scratcher. Perfect. I could slide it down inside the cast and scratch away. It gave me some relief. But even when the scratcher pulled clumps of sand and sea gunk out of my cast, none of the adults thought to take me to the hospital to have the cast replaced. After all, I only had a few weeks left until it was time to get it off. The day arrived. I couldn’t wait to get this smelly, itchy cast off. The doctor who had put it on was a little concerned when we told him I had done a lot of swimming over the six weeks. He fired up the saw. Fiberglass was tough stuff! Little yellowish shards flew here and there as he cut through it. (Fiberglass didn’t come in colors then). Finally, with one side sliced through, he pried it open. There was silence in the room, as the odor of weeks of trapped sea fodder filled our nostrils. The doctor said, “I’ll be right back” and left the room. I looked at my leg. Well, I couldn’t really see my leg. It was covered in sand, seaweed, and maybe a baby octopus. The condition of my leg was slowly revealed, as we peeled off things that should stay in the ocean. It was a collection of welts and open sores. The doctor returned to the room with a blue ribbon, my award for having the ugliest cast he had ever seen. It wasn’t until I became an adult that it occurred to me that the cast could have been replaced. Why didn’t someone, anyone, in my life suggest that? I don’t know. When I asked my mom, she just laughed, and said, “I never thought of that.” Really? But the one I want to focus on is how that cast was a picture of what my spiritual life sometimes looks like. I ignore things that are hurting me spiritually, maybe the amount of time I spend watching mindless TV shows or other forms of entertainment. Or maybe I harbor anger or resentment and let it grow into bitterness. And I don’t always cut off the hurtful things before they do serious damage. I let the ugly stuff fester instead of getting it out of my life. I need to use the wisdom God has given me and ask, “What’s the problem and how can I change?” And then I need to be willing to make the changes required. I am thankful that my Father knows exactly what to do and has the power to change my heart, if I would only ask him. Lisa Radcliff is a writer, speaker, women’s Bible study teacher, and a 35-year volunteer youth worker, residing in Pennsburg, PA. She is a wife, mom, and mom-mom who loves God’s Word but also loves football, chocolate, shoes, and Maine. Her hobbies include quilting, shopping, cooking, and raising Seeing Eye puppies. You can reach her at www.lisajradcliff.com. I remember how much fun summer vacations were as a child. Some of you may ask, “Are you sure they were all fun?” This question forces me to confess certain trips provided more joy than others. However, I try to remember vacations which resulted in the most smiles. Number one–the beach. A summer vacation wasn’t always guaranteed. My father worked long hours as owner of a farm equipment store. Spring and summer were the busiest times, which required working six days a week. If a farmer’s tractor broke down during planting or harvesting, dad opened up on his day off. He understood the farmers needed help. But he also knew the importance of spending time with his family. I guess even as a child, I saw how my father needed a break. The beach topped the list of his favorite place to relax. While my mother wouldn’t have chosen this location, my two brothers and I approved. She knew the value of honoring her husband’s decision, and started packing a week ahead of the trip. With the station wagon packed full of beach gear (umbrella, chairs, and floats), it’s a miracle my dad could see out his rear-view mirror. Add the kid’s back seat activity of arguing and shoving, and I’m not sure how we reached our destination without incident. Upon arrival, we checked into an old motel. We stayed there every visit. I remember dad speaking politely to the clerks, and how they provided a clean, well sort of clean, room. But as kids, the room didn’t matter. We would be spending most of our time swimming. After this activity, our room wouldn’t be clean very long. While this doesn’t sound like fun yet, our parents knew the long (to us) trip required releasing pent-up energy soon. Seeing our increased excitement, mother told us to put on our bathing suits. While walking towards the beach, the salty ocean breeze enhanced our senses. We tried to run, but each time mother shouted, “Walk!” So my brothers and I shuffle ran, dragging our feet to pretend walk. When we reached the walkway through the sand dunes, we charged towards our goal. Laughter and my “girl squeal” filled the air. I’m sure mother smiled, watching her children race towards the foamy surf. After a few seconds, excitement erased any memory of our concern. Soon we splashed each other, resulting in squeals, then changing to laughter. Under mother’s watchful eye, we ran in and out of the water, and back and forth on the beach. Soon dad arrived. He barely had time to place the beach gear down, before my brothers and I raced to grab the best float. As the youngest, I lost all the time. Yep, pretty sure I always lost. But it didn’t matter. I was with my family, and had smiles to prove it. Dad started enjoying his vacation when his feet touched the water. As a child, I didn’t understand how God’s blessing of parents who loved us resulted in fun for our family. I learned to praise Him for those moments, and countless more. Thank you God for the gift of family, the ability to smile, laugh, and love. “But now ask the beasts, and they will teach you; and the birds of the air, and they will tell you; or speak to the earth, and it will teach you; and the fish of the sea will explain to you. Who among all these does not know that the hand of the Lord has done this, in whose hand is the life of every living thing, and the breath of all mankind? I was sitting in my garden, preparing for a bit of solitude to enjoy the flowers and read my book, when a bumblebee flew by and sat down next to me. I used my book to create a discordance to send him on his way. I thought he would be on his way, but he advanced a little closer. I swatted at him with my book, and he took to flight. Instead of leaving, he buzzed annoyingly around my head. I jumped to my feet and let out a squeal that would rival a train whistle at midnight, but it didn’t scare him away. He raised his plump little body in a gesture of imminent departure. He surprised me by honing in on my nose, and hovering there as if to declare that my bench belonged to him! Sliding beyond the realm of fear; I stared him straight in the eye, and made a declaration of my own: “Someone will leave this bench, but I daresay it will not be me!” To my horror, I realized that I was fighting a battle of wills with a bumblebee. Feeling a bit foolish and embarrassed, I changed my strategy and sat down quietly to read my book. The bumblebee obviously got the point, or became bored with the game we had been playing. Without so much as a flutter, he lifted his wings and rudely flew on his way. The next morning, when I came out and settled on my bench, all was peaceful with no distractions. I guess I had shown that bee who was boss. I smiled with pleasure at having my bench to myself again. I opened my book, settled in and began to read. I heard a buzz beside me and I knew, before I looked, that it was that wretched bumblebee! But I had made a decision to maintain my composure; therefore, I stared at my book without moving, except to turn the page. The bumblebee sat just as still as I, and, thus, a pattern developed. Two separate species, from two different worlds, became silent companions; and, for that summer, I shared my bench with the bumblebee. Leaves began to fall and air turned brisk, but on one particularly lovely day, I went outside to enjoy one last sojourn in my garden. The bumblebee came and landed gently on my shoulder. I accepted that as his goodbye, but I humbly admit I felt a sense of loss over that “pesky” bumblebee. Prayer: Loving Father, through your love for us, we find generosity and compassion for all your creatures. Give us a pure heart that we may find the beauty around us. In Jesus name, amen. I don’t know about you, but I sometimes feel like I struggle with laziness. I’m not sure if it’s that I am in fact lazy, or that I’m disappointed at the end of the day when I haven’t been able to cross everything off my list. (I’m definitely a list maker!) I don’t know if it’s because I work at home, that sometimes it’s easy to get distracted from work. I’m a writer, editor, and book reviewer. All of those cause me to sit. Either way, it’s something I’ve taken to God. Over the last several months I’ve prayed each morning for productive day, free of laziness. God has helped me by nudging me to do “one more thing.” Each day, when I attempt to sit and do nothing, I tell myself, “one more thing” and I find one more thing to accomplish. Then there is that afternoon slump. There are many afternoons I feel like I could simply lay down and take a nap. Because I work at home it would be so easily done. The one good thing about me is that I’m not a nap taker. I never actually sleep and I feel worse after I get up so I don’t even bother trying. Instead, I use my afternoon slump as an opportunity to do one more thing. I know that if I get up and move around, I can work my way through the slump. It often ends up that more than one thing gets done. For instance, tonight, after dinner it would have been easy to simply clean the kitchen and call it a night. But, I knew I needed to put some bread in the oven to prepare for tomorrow night’s dinner. Before cleaning, I put the bread in the oven to do its thing while I cleaned. Two birds, one stone. Then, as I was pulling the bread off the pantry shelves to cut up for stuffing, I realized it wouldn’t take much more to move all the items on the shelf so I could wake them down and give them a good scrubbing, which they had needed for a while. Now, I sit here writing this blog post. Instead of quitting, I’ve accomplished three more things that can be removed from tomorrow’s list. And that makes me feel better. Don’t misunderstand me, being lazy once in a while isn’t a bad idea. In these hazy, days of summer, there’s nothing more I enjoy than time at the pool. Being lazy once in a while is probably necessary for sanity’s sake. Being wives and mothers takes up so much of our time, but let’s use that time to the best of our ability. We will never have EVERYTHING done. That’s just the way life works. Examine your life today, maybe you need to do that one more thing. Now, if you’ll excuse me I’m going to get some watermelon for a snack.…hmmm…maybe the fridge needs to be cleaned out. FREE PRINTABLE To Do List available from Our Misfit Isle. 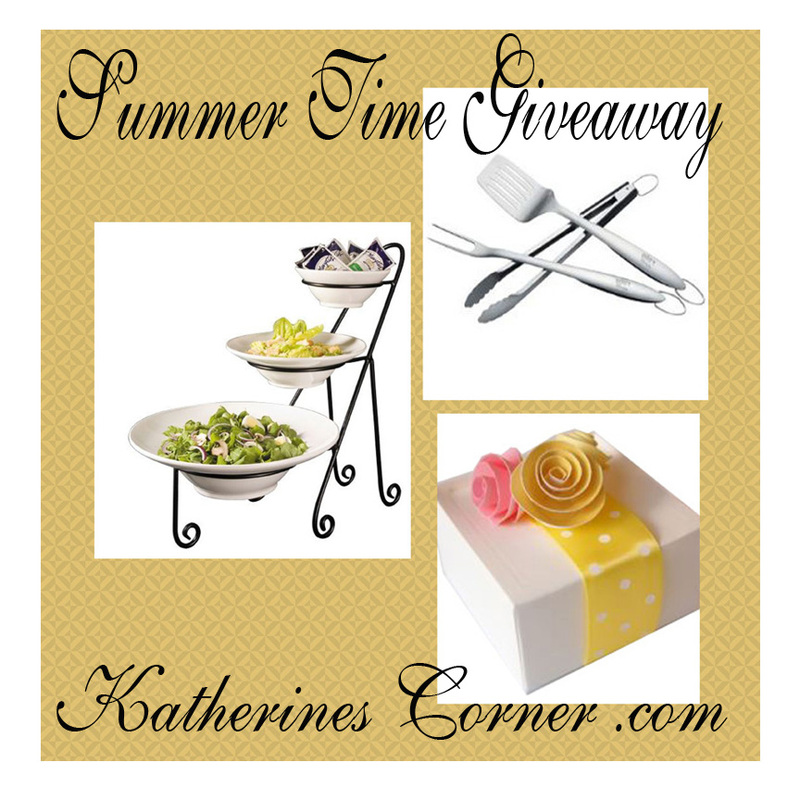 Every month there is a new giveaway, sponsored by Katherine’s Corner. This one is just perfect for summer: “Fan-tastic Giveaway” and it’s sure to keep you cool! Katherine’s Corner subscribers have the opportunity to win this wonderful Hunter ceiling fan and $200 in cool cash ( via PayPal)! A big thank you to my Giveaway sponsor Bellacor and to some of my sweet bloggy friends who joined me in adding $200 to this months giveaway! Good luck in the Fan-tastic Giveaway! Ruby for Women is honored to share with you this amazing giveaway and a great opportunity to join a fun blogging community at Katherine’s Corner. Enter to WIN the Summer BEAT the HEAT GIVEAWAY! Its hot outside and Katherine from Katherine’s Corner is having a giveaway to help you beat the heat. She invited me and a few more of her bloggy friends to join in the fun. Enter to win some cold hard cash and a set of fun ice cream bowls and spoons for prizes ( ice cream not included). We all bring you the Beat The Heat Giveaway! Entering is easy, log into the entry form using your email address or Facebook and click on the first entry on the rafflecopter form. Then read the terms and conditions and write yes. Follow Katherine’s Corner and her blog Partners then enter as many bonus entries as you would like. Open to all over 18. Giveaway starts today and ends Aug 30th. Copy the button below and paste it to your blog for extra entries. Or copy the code from Katherine’s sidebar ( remember to let her know where to find it). Ruth O’Neil is a member of the Ruby Blogger Team. Her post “Summer Afternoon” reminds us of childhood joys of summertime. We hope you will enjoy her memories of summer afternoons. The thoughts of a summer afternoon bring about a lot of memories for me. When I was a child summer afternoons were filled with fun activities; and those activities didn’t involve any sort of electronics! One camping weekend when it was exceptionally hot. Even the adults weren’t too proud to get in a wading pool. That’s sister Sarah waving a greeting. One of our camping weekends where we got a “little rain” overnight. Our family spent a lot of weekends camping. Many of those weekends we would see the same families over and over again, allowing us to make friends who didn’t really live anywhere near us. There were always campfires, campfire pizzas and pies, s’mores, staying up late and running around with friends until our parents came to hunt us down and send us to bed. One of the things my sisters and I liked to do was play badminton. We were the badminton Queens, at least that’s what we thought (and maybe we still do!). We spent hours in the road hitting that birdie back and forth. Yes, we really did play in the road. We were each responsible for watching for cars coming behind the other, which wasn’t many where we lived. Many summer afternoons at home were spent riding our bikes. We would make trails in the dirt along the side of the road or in the woods next to our house. We would make up our own traffic laws and obey them. We would sing, pretending our voices were the radios. I think the one thing we spent the most time doing was swimming. My mom happily paid for the family pass to our community pool – getting us out of the house for a good part of the summer. That paid for swimming lessons and we could spend as much time at the pool as we wanted. The pool opened at 12:30. My siblings and I would bike the 4 to 5 miles there and then swim with friends until we had to be home at four. I think the only thing that kept us from the pool was thunder. Oftentimes we would stop by the library on our way to the pool and get new books to read while we lounged in the summer sun. Maybe that’s why I still enjoy a good book by the pool! Me and my mom at the Grandparents’ camp in PA with Pine “Crick” and the train trestlein the background. Another one of my favorite summer activities was going to my grandparents’ summer home. Grandma always called it P-A, saying each letter, since it was in Pennsylvania. Badminton was always one of our activities there, along with playing in Pine “Crick” (you have to say it like my grandma did), going out in the canoe, watching trains as they sped through the yard (literally), and playing drive-through restaurant through the sliding screen in the kitchen window. How I long for the days of a childhood summer! We were truly carefree. This is what a carefree childhood summer looks like! So, what memories does “Summer afternoon” bring for you? I’d love to hear them. Read more of Ruth’s posts on her blog, Ruth’s Real Life. We are excited for the opportunity to share with you, our readers and followers, some of the best blog posts from the members of the Ruby Blogger Team. As we celebrate our nation’s birthday, it is good to reflect on our history and remember the people and events that shaped our country. Here at Ruby for Women we are grateful to God for His blessings on our nation and His gifts of freedom and liberty, family and friends, and the opportunity to worship Him as we feel led. Won’t you celebrate with us today? Visit Lynn at her blog where you can read more of her inspirational posts. It’s summer! We are all looking forward to the upcoming Fourth of July holiday weekend, so we thought it would be a great time to share some outdoor living tips with our readers.Here are some great ideas from Katherine’s Corner for making the most of your outdoor grilling this weekend and for all the glorious summer weeks ahead! My sweet hubby and I enjoy grilling and we love to Build a Better Burger. Today is the perfect day to share a few of our burger grilling tips. We love to try new things with our burger recipes too. But I’ll save that for another day. Not all of our burgers are beef, we like a nice chicken and veggie burger too. But today it is all about the beef. Always grill on a clean grill. Use a stiff wire brush to clean your grill. Wipe clean and then heat your grill while you prepare the meat. Try to avoid extremely lean ground beef use 80/20 its perfect on the grill– Low fat beef may dry out while grilling. Ground sirloin is our favorite. Seasoning– this is all you! Season your meat well using your favorite seasoning mixture. We use a simple mixture of equal parts garlic powder, onion powder and black pepper mostly. Grill your burger with the barbecue lid open/off– you must keep a close watch while grilling burgers. Do not toss on the grill and walk away! DO NOT flatten your burgers with a spatula while you are grilling- this squishes out all of the juices that make your burger flavorful and thick. Flip –You only need to flip your burger once ,flip when you see the juices starting to pool on the top. Grills have varying temperatures so I can’t say for certain how long this will take for you. It takes about 4 minutes for our grill. Flip and cook for a remaining 4-5 minutes. Use a meat thermometer- food safety is a must-use the meat thermometer to make sure your meat reaches 160°. Add the Cheese- if you are a cheeseburger fan this is when you do need to close the lid. Place your cheese on the patties and close the lid for about 30 seconds and that should be plenty of time to melt the cheese. Rest-let your burgers rest on a plate for about 5 minutes before serving-this lets the juices settle and gives you plenty of time to prepare your buns too. On a side note- know where your meat comes from, a trusted butcher is often your best place to buy meat. According to the US Department of Agriculture, the contaminated meat currently being recalled may have been shipped to 10 states: Florida, Illinois, Indiana, Kentucky, Michigan, Ohio, Pennsylvania, Tennessee, Wisconsin and North Dakota. Have a wonderful weekend everyone. Be safe have fun! A lot of people travel fifty miles or more on a summer weekend making the roads, parks and mountains in our area very busy places. We have some of the most beautiful mountains in America here in Utah. We take many trips to our nearby mountains. But we rarely travel during the upcoming holiday weekend. Instead we stay close to home and enjoy our time together by playing in the yard, planting flowers and grilling! 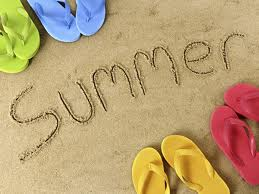 Ruby for Women wishes you all a very safe, happy, and joyous summer! Celebrate freedom, enjoy your friends and family, and take a minute to share some of the pictures with us from your summer adventures! Be sure to visit Katherine’s Corner for inspiring posts, great recipes, giveaways, and creative projects. The year was 1952. It was Friday and my dad would soon be home from work. I was always happy to see him, but on Fridays, I was most interested in where he parked the car when he came home. If he pulled it into the garage, my spirits would tumble because that meant we were staying home. But, if he left it in the driveway, I was ecstatic. That was a sure sign we were going visiting after supper. I lived in northeastern Indiana, in the country with very few neighbors and since my mother didn’t drive, the weekdays could become boring; but oh, those Friday nights. Friday was the only day of the week this visiting ritual occurred. I suppose the reason was there was work to be done on weekday mornings and church on Sunday. My parents were up at 5:30 every morning so I didn’t know what difference it made, but that’s just the way it was. My parents used to joke they didn’t need friends; they had relatives. Between the two of them, they had 11 siblings. Those unions produced 63 cousins. A few of the cousins with my grandmother. With the exception of 2 families, they all lived within a 10-mile radius of each other. I don’t know how they knew where to congregate on a Friday night or how many would be there. None of my aunts and uncles had telephones and I know they didn’t waste a stamp on a post card. Perhaps they discussed it after church on Sundays. You’ll be ‘it’ if you pull back. I had already pulled my foot out of the circle. That action, of course, meant I was always the first one to be ‘IT’ in the game of hide-and-seek. Some of the cousins thought they were too old to be playing childish games, so it was the ‘twelve and under’ crowd that played. At age 6, I was the youngest cousin in the group. I hated being ‘IT’ but I loved the fact that I was included. In retrospect, I was probably only included because they knew I would pull my foot back first and then be unable to catch any of them before they made it back to base. Base was the well platform where the metal legs of the windmill were anchored. There were many places to hide; behind the wood house, on the backside of the chicken coop, in the corners of the house and by the barn. We all knew better than to tromp through my aunt’s garden or flowerbeds. It would be dark outside with only the moonlight to help see the running shadows as they made their way back to base before being tagged. The calls of ‘Ally, ally in free’ would echo through the darkness. I would eventually manage to tag someone. Then that person had to hunt for the rest of us. When we were all too sweaty and exhausted to run any longer, Uncle Art would bring the wooden ice cream freezer out to the well cover. He would tell the bigger boys to turn the handle and keep it filled with ice and rock salt, alternating layers. While the boys took turns cranking, some of us would ask for a canning jar and proceed to catch fireflies or lightning bugs, as we called them. We put them in the jar and watched them light up. They were so plentiful; it was like having your own flashlight. Occasionally, we would hold them in our closed hands; not tight enough to squish them, but closed enough so they couldn’t escape. If we parted our fingers just a bit, their light would shine through the cracks. We never killed them and when the ice cream was ready, we set them free. My aunt would add whatever fruit was in season at that time, so the flavor of the ice cream was always a surprise; strawberry, peach, blueberry, blackberry. We really didn’t care; it was always delicious. The cold, creamy mixture would coat our spoons and run down our parched throats. We sat in the grass and ate every bit of it. Were there mosquitoes? Probably, but I don’t recall having lots of bites. The adults would announce it was time to go home. I usually fell asleep in that short distance, with ice cream remnants still crusted around my mouth and a smile on my face. It was only 7 days until next Friday night. Gloria Doty lives in Fort Wayne, IN. She has 5 grown children and 13 grandchildren. She is a freelance writer, with articles appearing in various magazines. She is a regular contributor to Ruby for Women, an online Christian women’s magazine, and to 2 daily devotionals, published by Creative Communications for the Parish. You can follow her exploits at www.writingbygloria.com She still sees many of her cousins but they no longer play Hide-and-Seek. The summer issue of Ruby for Women is filled with inspirational articles by our team of Ruby writers, as well as craft tutorials and recipes from around the blogosphere. You will be encouraged by the words of wisdom found in “The Weak are Made Strong: Women in Power” by Amanda Johnson. You will be blessed by the heartfelt wisdom in “Father to the Fatherless” by Jane Hoppe. Get to know authors Lynn Mosher and Linda Au in our interview articles, written by Beth Brubaker. Read “An Invitation to the Kitchen Table” by Sharon L. Patterson, and discover the beauty of words in the poetry of Keith Wallis, Lanette Kissel, Linda M. Crate, Cindy J. Evans, and Connie Chandler. The summer issue of Ruby for Women features writers from the United States, as well as from Canada and Australia. All of our writers and authors share their words of wisdom, hope, inspiration and encouragement with you, our readers, as God guides them in their ministry of writing. We hope you will enjoy this issue of the Ruby for Women magazine! Submissions for the autumn issue of Ruby for Women can be submitted to editor@rubyforwomen.com For more information, please visit our submissions page, HERE. Final call for submissions to Ruby for Women summer issue. We are wrapping up the summer issue of the Ruby for Women magazine, but there’s still room for your family-friendly article, story, or poem. We would also love to share your favorite summer recipe, or a fun craft project, or a book review with our readers. Tell us about the books on your summer reading list! Summer is a great time to share your gardening tips with us, or perhaps you have some quick and easy recipes for summer meals that get us all out of the kitchen and off to the park, the beach, or some other adventure. Speaking of other adventures . . . . what are you planning for a family get-away this summer? Vacation plans? Our readers love to hear about YOU, your life and family, and your great ideas for making life a bit more meaningful every day. If you would like to send in a submission for the summer issue of the Ruby for Women magazine, contact us at editor@rubyforwomen.com or visit our Submissions page here on the Ruby for Women blog. We’ll be watching for your submission, but hurry, we need it by the end of this week. Hope you can join us at Ruby for Women! This blog is shared by Kristin Bridgman of Ponderings. I know summer is not over yet, but schools are starting back now and I want to savor this season as long as I can. It’s my favorite. I want to soak in every drop before it seeps out into Fall. I feel my best in the summer, maybe because I’m drinking in all that Vitamin D from the sun, something I miss terribly in the winter. SO. . .a savoring and a pondering, here I go. . .
the way the green grass feels on barefeet. Entering is easy, you can log onto the entry form using your facebook or email address. There’s just one mandatory entry ( you must click the first entry and leave a comment on how you follow Katherines Corner) and then you can click on one, or all, of the extra entries on the rafflecopter entry form. ( note it may take a second or two to load depending on how many entries there are). I love giveaways too. Please let me know if you are having a giveaway. * some countries may not allow this type of prize to be shipped please check with your postal customs rules and regulations to determine if your country is among them.Katherines Corner takes no responsibility for lost or misdirected mail to countries outside of the US. It’s summer ya’ll and time to eat some good ole’ juicy blueberries. 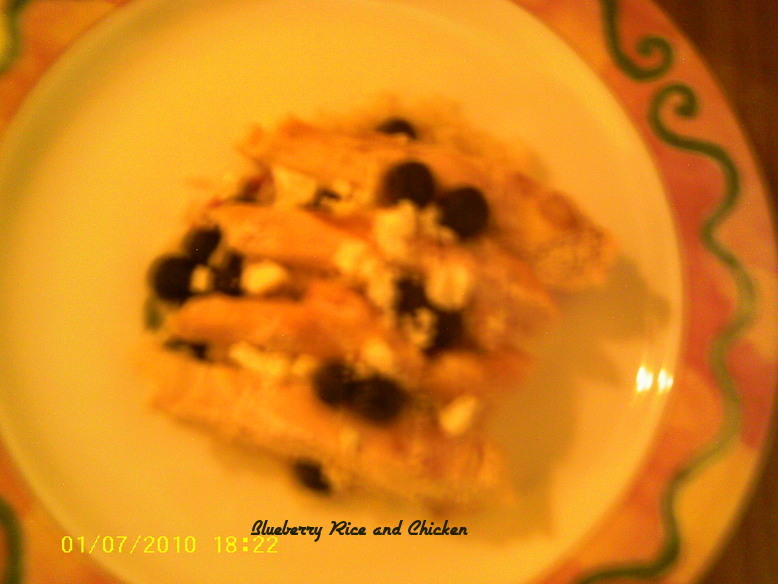 One of my favorite summertime dish is blueberry rice with chicken. Yummy in your tummy ya’ll! Hello and welcome to my meme Tuesday Cuppa Tea. Find a comfortable seat, a cup of tea and relax! My teacup today is another blue and white one, this time made of ironstone with a pretty basketweave pattern and blue roses. The cup and saucer was made in the 1950s by Wedgwood &Co., Enoch Wedgwood, England. BUT…it’s not thw Wedgwood we think of with the jasperware I shared last week. This Wedgwood, although a relative of Josiah Wedgwood, had his own pottery in Tunstall, the Unicorn pottery, which explains the device or symbol. They were a busy pottery family! I love the basketweave feel of the pattern, and, of course, it’s blue and white! For more info on the teacup atAntiques And Teacups, click on the photos. Summer has officially started, and the sun has been out in full force. Nothing can make me feel happier than being outside on a warm, or hot, sunny day! For someone like me that lives in Northwestern Pennsylvania, that’s nothing to take for granted. We don’t have very long summers and sometimes they can be rather cloudy and rainy, so I try to take advantage of every beautiful day that we are given. In fact, just a little side note – we just found out that our little town is going to be featured in the television show, “Today in America”, hosted by Terry Bradshaw, as one of the top 30, class 3 (probably based on population I’m guessing) cities to live and work in America! They filmed here on June 16 and it will air sometimes in September or October. The lazy days of summer have hit our home. We took a week camping in the Sequoia Forest at Hartland Christian Camp. It was a wonderful way to finish off the school year – homeschool family camp! The last week has been spent just hanging out, doing laundry, and enjoying the kiddie pool. Usually for summer break, we only have the month of July. My daughter worked hard to finish before camp in order to have June off too. This past school year started last July since she broke her arm/wrist and spent the summer in casts. This week in the Captured Moments community group at the Ruby for Women page, we are sharing pictures of what summer fun looks like to us. In our household summer fun is all about water play. Here in the deep south it is not only hot, but sometimes unbearably humid. The only relief is playing in the water and making a game of it so you forget that you were miserable and bored just a few moments ago. If you would like to join in the fun of sharing your photos or join in the fun of our weekly photo prompt please join us at Captured Moments. Otherwise please join in the fun of a Wordless Wednesday blog hop. Just link up your blog post for Wordless Wednesday, and then share our link and logo with some of the other Wordless Wednesday hops. Looking forward to connecting with lots of new bloggy friends through our interactive Wordless Wednesday Blog Hop!